Day two of job training complete! I am so excited to be working again, I have been climbing the walls since LA Marathon last month! I didn’t expect to take such a long hiatus from one job to the next (about two and a half months), but the search did not go as easily as I thought it would. This was mostly due to the fact I didn’t apply for any restaurant jobs, which is basically all I’ve ever done. So I’m 36 and starting over, at an entry level position in a gym, working member services (front desk). It was an easy decision to take a break from restaurants, but the follow-through was difficult. When I got discouraged applying to jobs with no call-backs, I wanted to just go for what I knew. I was honestly very, very close to giving up on a new path. Self-doubt set in too, like “what business do I have not working, and going for what I want? We are running out of money and I am being selfish.” But, Mike and I gave up the luxury of our own place so we could both make big career moves, so it was important I follow through with what my heart wanted. For the first time in my adult life I had the freedom to be choosy, so why not take full advantage? All I can say right now is, thank goodness I got the call back when I did! I decided in the midst of my job search, broken-down by a 12 hour gig, to end my 52 day run streak. I tried to pick it up again, but I just didn’t have the heart anymore. I’d wait til 11:30pm to go out for one mile that I had dreaded all day, and this is not how I want running to feel. I get to run, I don’t have to run. I’ve decided to try a run/walk method on my runs, and give myself more recovery time between runs. My life is changing (again – in one year I’ve started job #3, moved from DTLA to Santa Monica to Claremont) and I want the emotional and physical strength to go with the flow. When I have a more set schedule, my job becomes second nature, and I have a gym membership, I would like to start the streak again. I made it 52 days, and next time I’d like to reach 100! 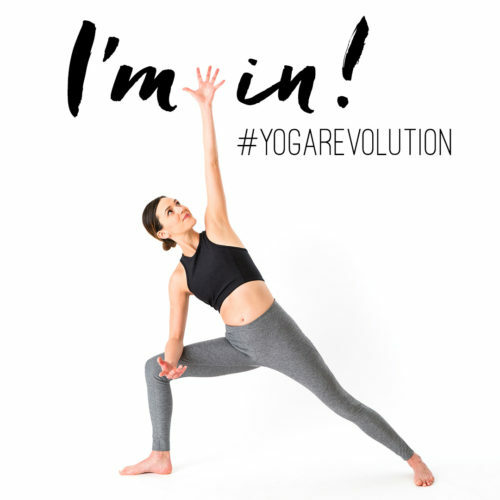 Yoga Revolution Day One – Practice Ease. It was a treat to practice before work, as it was gentle and shifted me from sleepy to ready to tackle the day! The thing is, I’ve really loved the commitment to exercise everyday. I was inspired by practicing True most days in January, no matter where we were (I rolled out my mat in Arizona and Vegas!). Being committed to True inspired the run streak in February through most of March. And so I’ve decided to revisit Yoga Revolution, which I never finished, though started about four times last year. Until I get the gym membership to the bikes and pool for cross-training (leading up to perhaps a triathlon late in the year!) I have to cross-train at home. I’ve always cross-trained at home, and I really enjoy it. Yoga helps strengthen my mid-section and upper body, while encouraging me to stretch out all the areas running makes super tense and tight. The practice gives me a half hour or so to set intentions for the day, or decompress at night. I’m stoked to start this journey again, finish what I started in 2017, and open myself up to new possibilities or opportunities that may lend themselves to me as I embark on another fitness journey!